At Def Con 25, Apple Watch jailbreak on watchOS 3 has been successfully demoed courtesy of Max Bazaliy of Lookout and the Fried Apple Team. 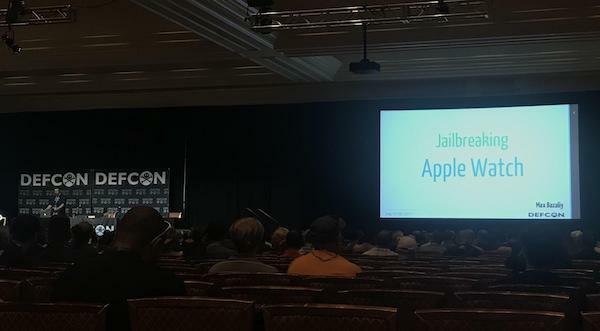 At the conference, which is still going on in Las Vegas, Bazaliy not only demoed a working jailbreak for the Apple Watch but also went into full detail on how he went about achieving it. According to Bazaliy, the advantage of having jailbroken Apple Watch is the access to full file system and even databases which houses data for things like health and fitness, calls, messaging, emails, and contacts. A jailbroken Apple Watch also provides access to SMS, calls, Apple Pay, photos, calendars, GPS, call recordings, microphone and more. It is important to note here that this is the first of its kind jailbreak for Apple Watch providing full root and SSH access as previous attempts have only managed to hack Apple’s wearable to some extend but were not fully jailbroken. Bazaliy has also made slides from his “Jailbreaking Apple Watch” talk at Def Con available for download should anyone be interested in how he went about jailbreaking the Apple Watch. You can check out the slides embedded below. Currently, Bazaliy’s jailbreak is meant for private research and use only with no indication on if it will ever be made available for public use in any kind. As always is the case, we will keep you updated as we learn more about it. Stay tuned for more. Indeed. I would very much enjoy having a jailbroken watch, if only to install new watch faces besides just the ones they give you to customise. Sure I can do images, but I’d love some more functionality. Regardless. A very interesting talk. Hopefully something comes of it.